It has been five years since the Sewol ferry sank in the waters off Korea's southwestern island Jindo, claiming over 300 lives, mostly Danwon High School students who were on an excursion to the scenic Jeju island. The tents of the Sewol memorial site at Gwanghwamun Square, which became a fixture over the years, were taken down last month, but it does not mean the maritime disaster has been forgotten. The Sewol sinking caused a serious disaster-induced trauma all over Korean society and changed perceptions on public safety and solidarity. "The Sea Will Not Sink," a memorial exhibition for the Sewol ferry disaster, is held in Seoul and Ansan, Gyeonggi Province, on the occasion of the fifth anniversary of the tragic incident to shed light on the continuing impact of the disaster on the nation. The exhibit not just mourns over the disaster, but focuses on how our senses have changed after the accident and the change is irreversible. "We lament over the Sewol ferry disaster and the oblivion became official. However, our world can never be the same before and after the Sewol disaster," said Ahn So-hyun, director of Art Space Pool and co-curator of this exhibit. "Some of the artworks on view were created before the accident, but we can still read the Sewol disaster from them. We express our sadness about the disaster, but this exhibit also questions how it changed our life fundamentally." Forty artists take part in the exhibition, organized by the 416 Foundation, established by the families of the victims. The Ansan exhibition is held at the Ansan Art Center in the city that houses Danwon High School and centers on the last five years through artistic perspective. Photos of classrooms where victims attended are on display with a chronological table showing what happened in the five years after the accident. The classrooms are no different from other ordinary classrooms in Korea, but along with the context, the shadows of the harrowing accident loom over the classroom. 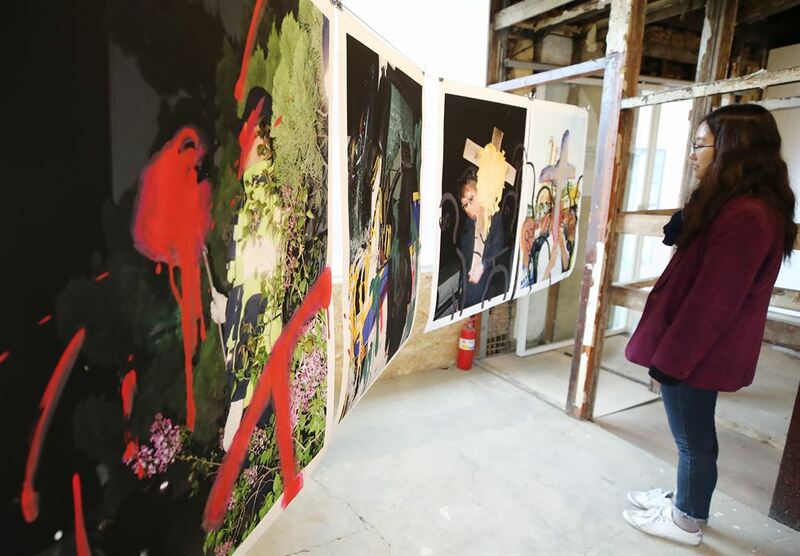 The Seoul exhibit is held at five different locations in Seochon area ― Space illi, Boan Yeogwan, HArt, Space 291 and Art Space Pool. It would take about 40 minutes to visit all the galleries on foot, excluding time for appreciation. "The venues are close to Gwanghwamun Square, where candlelit rallies to remember the victims of the Sewol ferry disaster were held. This is where the bereaved families walked and we wanted to create a pilgrimage route on this symbolic space to give people time to think about the disaster and its aftermath," Ahn said. Most of the works do not reference the Sewol ferry disaster directly, but viewers cannot help but relate them to the disaster. Space illi is at the beginning of Seoul gallery tour. Artworks on display here were created before 2014, but they remind us of the disaster that took lives of many students. For instance, Choi Jin-wook's 2011 painting "Bugahyeon-dong 3" depicts a common urban scenery with a group of students, but its unfamiliar use of color brings ominous images from the Sewol disaster. Boan Yeogwan, the largest venue in Seoul, focuses on before and after the disaster. Artist Lee Eui-rock used Google Earth to virtually visit the Sewol sinking location. Though the dry images of the sea ― taken in 2012 and on April 23, 2014 ― are not biased, viewers can read the change in situation from them. Photographer Sung Nam-hun captured the objects dedicated at Paengmok Port, where a memorial altar for the Sewol ferry disaster was situated. HArt features cartoons that imagines ordinary life before the Sewol ferry disaster, while photographic works at Space 291 show how our perceptions inflect the disaster on those actually not related directly to the disaster. Art Space Pool shows how the weak formed solidarity after the disaster. Photographer Noh Soon-taek specializes in portraying humane issues and he captured sceneries of the political underclass banding together, including the families of the Sewol ferry victims. "Some people may still feel hurt when they think of the Sewol ferry disaster. But we want to show them it is not someone else's issue, but close to our life through art. The Sewol was not just a ship, but the sea. We named the exhibit to continue the effort to change the world, not just mourning for it," Ahn said.